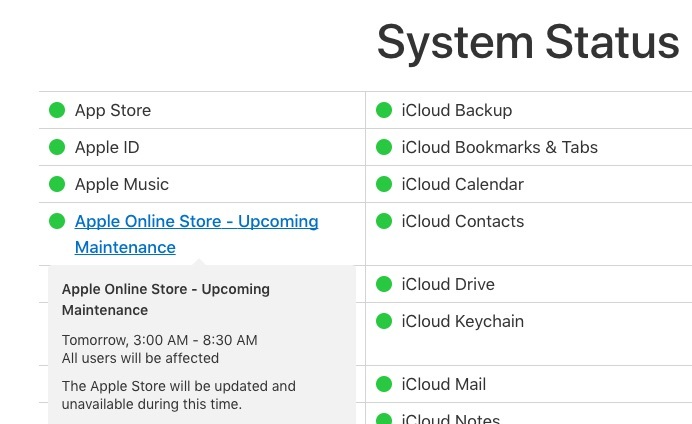 Apple has updated its System Status page to indicate that its online store will be "updated and unavailable" due to "maintenance" tomorrow, Tuesday, March 21, between 3:00 a.m. and 8:30 a.m. Eastern Time. The timing of the downtime is notable given that Apple is rumored to launch new products as early as this week. Moreover, Apple commonly issues press releases at 8:30 a.m. Eastern Time, which is exactly when the so-called "maintenance" update is scheduled to be completed. Last week, a well-known research firm that requested confidentiality told us that, based on their own sources, it expects Apple to announce new products later this month, most likely during this week. The research firm did not say which products it expects Apple to announce, but rumors have widely suggested new iPad Pro models could be unveiled as early as this month, including updated 9.7-inch and 12.9-inch models and an all-new 10.5-inch iPad Pro, although the latter is less likely without an Apple event. At this point, it remains unclear if the 10.5-inch iPad Pro is even ready, so its introduction could be delayed until a future Spring event or WWDC 2017. However, a press release would be appropriate for the more iterative updates expected for the 9.7-inch and 12.9-inch models, along with any other smaller announcements. Given that it is already March 20, and that Apple usually invites the media to its launch events at least 10 days beforehand, an update to its online store accompanied by a press release is likely at this point if new products are imminent. Japanese blog Mac Otakara said Apple will host a March event to debut its new iPad Pro lineup, an iPhone SE with 128GB storage, new Apple Watch bands, and a red color option for iPhone 7 and iPhone 7 Plus, but an event this month is looking increasingly unlikely with only 11 days remaining in March. Apple recently redesigned its System Status page to provide more granular details about the statuses of its services, so there is no precedence for the page foreshadowing new product announcements this way. Accordingly, it is certainly possible that the downtime will indeed be related to maintenance and nothing else. Mac Mini and Mac Pro are being removed from the online store? Crossing my fingers they will, at long last, update the headless desktops. My server room is growing cobwebs. Highly doubt we will see new products, but would love to see an updated MacBook. I have an inside source that says Apple will be announcing something this year. Where's the downvote when you need it? OR... OR... it's down for actual maintence. I seriously doubt we'll wake up with unicorns flourishing the Apple Store. I predict no new products.